Jeff Keyzer, Mitch Altman and Andie Nordgren have created a seven page comic book about soldering. The style reminds me a little of Forrest Mims’ Getting Started in Electronics. 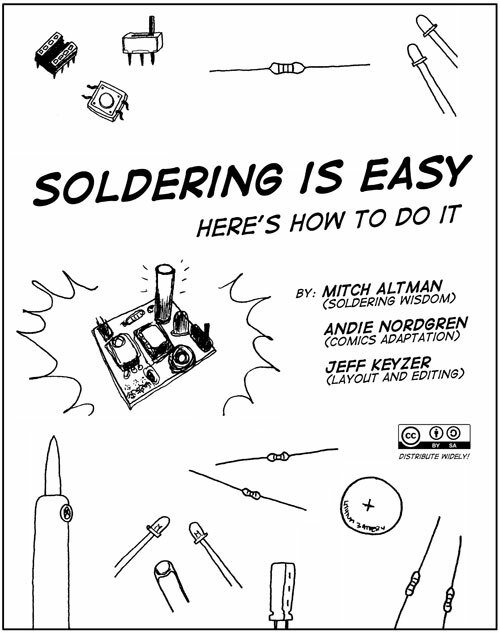 In any event it is a great book and will be part of a bigger book “How to Make Cool Things with Microcontrollers (For People Who Know Nothing)” which will be released later this year. The Authors have been kind enough to release the comic under a Creative Commons license (Attribution-ShareAlike), so you are free to teach with it, color it, modify it, share it with your friends, translate it, and basically do whatever you like with it!